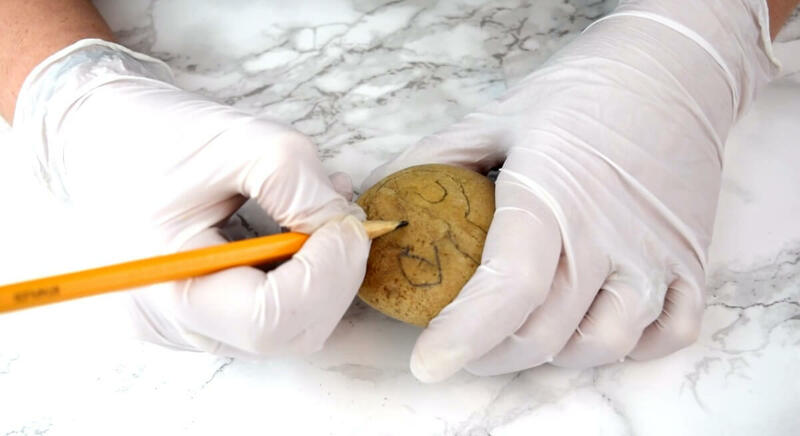 This bunny rock painting tutorial is sure to get the “awws” and would make a great addition to any rock collection. 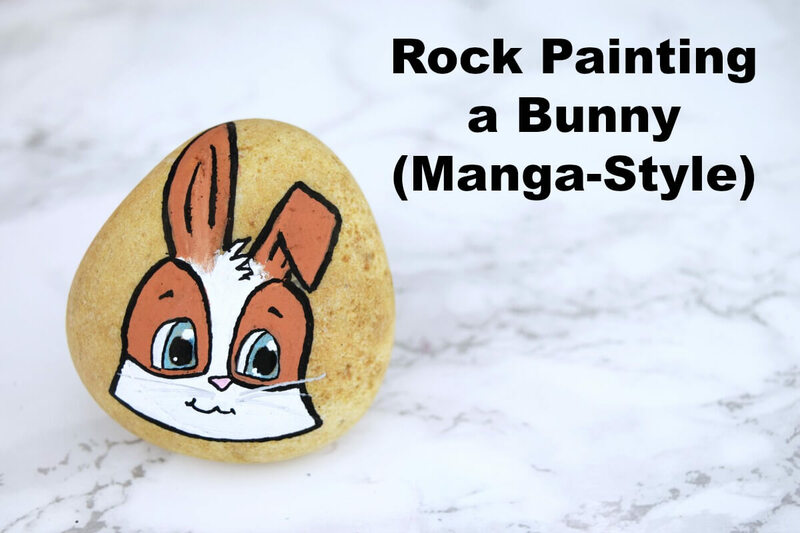 Get the full rock painting tutorial and learn some tips on drawing Manga style animals. Recently, my daughter and I started learning to draw manga-style animals influenced heavily by Christopher Hart. Both of us are making strides and I thought I’d share this adorable Easter bunny rock painting tutorial with you. 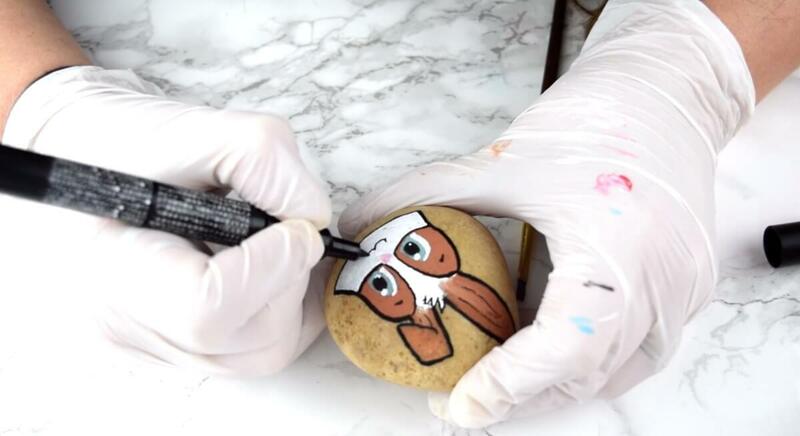 Psst: if you’re a visual learner, scroll down to the bunny rock painting tutorial video. Step 1 – Sketch the face. Start with the ears – your choice, one floppy and one straight, both straight – it doesn’t matter. Just know you might have to adjust in the next step, depending on the size of your head. Speaking of the head, create a circle for it – we will be adding the puffy cheeks later. Adjust the ears, if necessary. 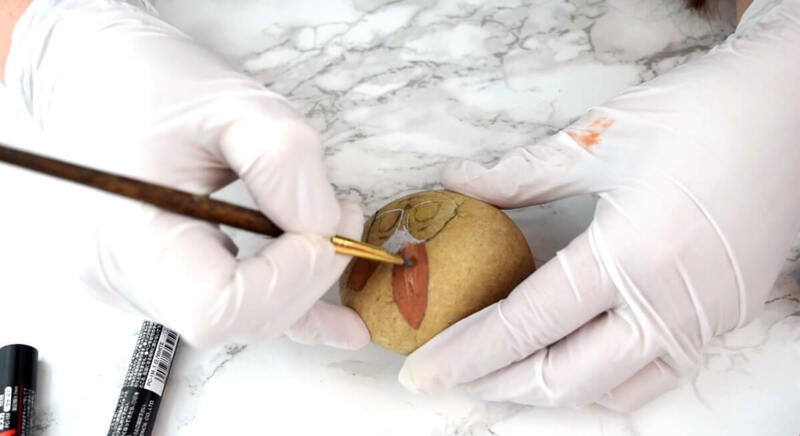 The benefit of this design is that it’s such a simple rock painting idea that you can customize! Now that you have the head and ears, create guidelines for the eyes, nose, and mouth. I create a vertical center line (sometimes a bit off-center if the head is turned) and two horizontal lines for the eyes. Next, draw a rough outline in the shape of a triangle (or heart) for the nose. Lightly approximate the mouth – I used two half-circles for a smiling mouth, but know that you could also have the Easter bunny (or just a plain ‘ol rabbit) with an open mouth and a little tongue peeking through. I chose to add a little coloring for our rabbit rock painting, so I sketched out the eye patches (I saw this in Christopher Hart’s book – love it!). Flare the cheeks by drawing them out to a point and lining them up with the base of the head. Step 2 – Apply the first paint layer. I like to start with the lightest color so I can let it dry and build on it. I filled in the top center of the face with white paint pen. Just a tip: to make it look like fur at the top, use short strokes without coloring it in. Because I wanted to blend the white face into the center of the ears, I use the brown to color the ears and quickly blended with a thin paintbrush. Fill in the rest of the face (including any markings). Use a brush to blend or soften the strokes. Next, fill in the eyes. Start with the lids, then move to the large reflection. I find it’s easier to add the reflection first and build around it than it is to color white on black. I’m lazy. Once the reflections are done, create the pupil and then add the color. Add another reflection in the opposite lower corner of the eye. Mine are not symmetrical – oops. Eyebrows and outlines are next up. The only tip here is to keep things as even as you can. Color the pink nose (I blended red and white) and add in a smiling (or open) mouth. Now, it’s time to touch up any area (I added more to the white face to fill some gaps) and added another layer to the outline to really make it pop. If you’d like, sign, date, and tag the rock before moving onto the next step. Cover anything painted with a light coat of ModPodge. Don’t do a lot of working on top of the paint here because it will run. Once the ModPodge has dried, coat the rock in a layer (or 3) of polyurethane to seal and protect. 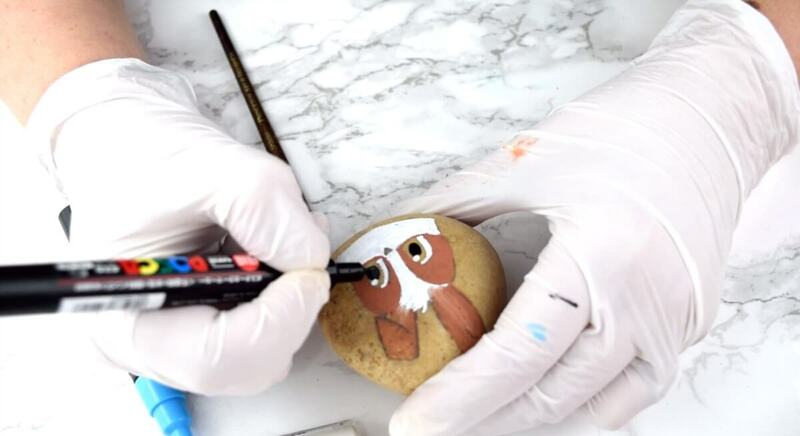 This bunny rock painting tutorial is sure to get the "awws" and would make a great addition to any rock collection. Step 1 - Sketch the face. Start with the ears- your choice, one floppy and one straight, both straight - it doesn't matter. Just know you might have to adjust in the next step, depending on the size of your head. Speaking of the head, create a circle for it - we will be adding the puffy cheeks later. Adjust the ears, if necessary. The benefit of this design is that it's such a simple rock painting idea that you can customize! Now that you have the head and ears, create guidelinesfor the eyes, nose, and mouth. I create a vertical center line (sometimes a bit off-center if the head is turned) and two horizontal lines for the eyes. Next, draw a rough outline in the shape of a triangle (or heart) for the nose. Lightly approximate the mouth - I used two half-circles for a smiling mouth, but know that you could also have the Easter bunny (or just a plain 'ol rabbit) with an open mouth and a little tongue peeking through. I chose to add a little coloring for our rabbit rock painting, so I sketched out the eye patches. Step 2 - Apply the first paint layer. I like to start with the lightest colorso I can let it dry and build on it. I filled in the top center of the face with white paint pen. Just a tip: to make it look like fur at the top, use short strokes without coloring it in. Because I wanted to blend the white face into the center of the ears, I use the brown to color the ears and quickly blendedwith a thin paintbrush. Next, fill in the eyes. Start with the lids, then move to the large reflection. I find it's easier to add the reflection first and build around it than it is to color white on black. I'm lazy. Once the reflections are done, create the pupil and then add the color. Add another reflection in the opposite lower corner of the eye. Eyebrows and outlinesare next up. The only tip here is to keep things as even as you can. Now, it's time to touch upany area (I added more to the white face to fill some gaps) and added another layer to the outline to really make it pop. If you'd like, sign, date, and tag the rockbefore moving onto the next step. Cover anything painted with a light coat of ModPodge. Don't do a lot of working on top of the paint here because it will run. Once the ModPodge has dried, coat the rock in a layer (or 3) of polyurethaneto seal and protect. We filmed a video to help those of us who like to learn that way. And if you’re interested in learning via video, subscribe to the Ruffles and Rain Boots YouTube channel. Did you follow the tutorial? Maybe you put your own spin on this bunny rock painting. Either way, come on over to the Facebook page and share your bunny rocks! Please pin this to your favorite rock painting tutorial board on Pinterest! I think my girls are going to have a LOT of fun rock painting this spring and summer. This is just the cutest!